The Guidelines offer cost-effective suggestions to minimize construction-related waste, create healthier and more durable homes, reduce operating costs for homeowners as well as methods to reduce the impacts of building in Contra Costa communities; including solid waste management, water conservation, energy efficiency and resource conservation. Due to the diversity of remodeling project types, assigning a “total points” value to a project considered to be environmentally friendly is not feasible. However, 25 measures have been highlighted to signify that every effort should be made to incorporate them into your projects. 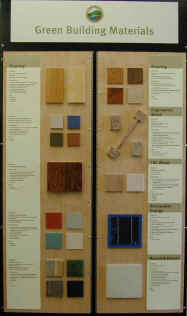 This List provides the names of the manufacturer of each product in the Green Building Materials Display as well as their phone number & website (when available). Additionally, the List contains contact information for local distributors that sell these products. This publication provides ideas for your home improvement. Published by the San Mateo County's Green Building Program (RecycleWorks). Home Builders Association of Northern California officially endorsed Build It Green’s GreenPoint Rated program in January 2008 serving as a major milestone in the mainstreaming of green building. Furthermore, the Association endorsed the adoption of mandatory green building standards in all 101 Bay Area cities and counties based on GreenPoint Rated.